The locks are fastened in place with two screws for easy installation. Re-keying or servicing is accomplished by removing the cam retaining screw and cam. 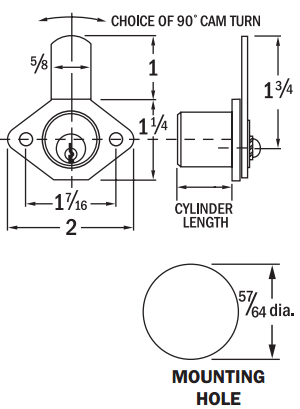 Use a 5/64” allen wrench to remove the plug cylinder assembly. The mounting plate remains installed on the cabinet. Re-key as required and reinstall cylinder plug assembly on mounting plate.